By now, you’ve heard that seven – count ’em, seven – terrestrial planets have been discovered orbiting the ultra-cool M8 star Trappist-1. According to the paper that the research team released yesterday, all of them could potentially have liquid water on their surfaces, although only three are judged to be good candidates: the authors’ model considers it likely that the three innermost planets have succumbed to a runaway greenhouse effect and that the outermost is too cold. But that still leaves three potentially habitable planets in a single system. 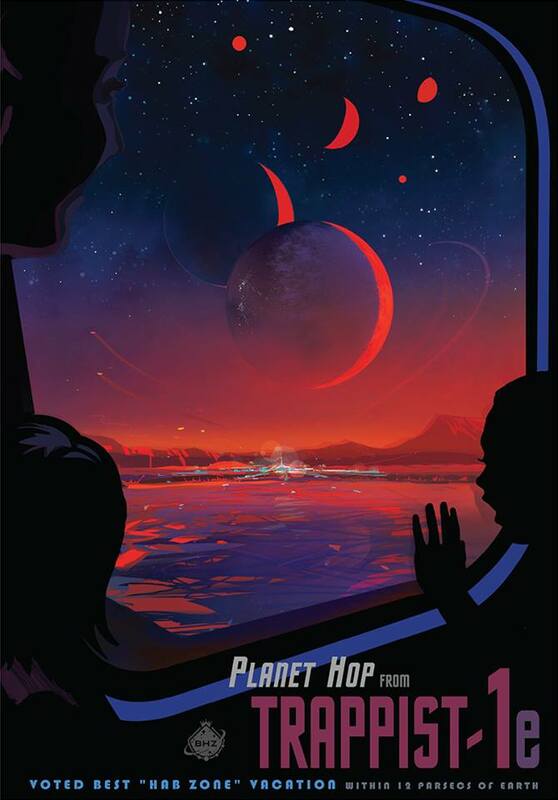 Those three – Trappist-1e, 1f and 1g – range from .62 to 1.34 estimated Earth masses, and as one would expect from a red-dwarf system, they’re tidally locked and orbit close to their star with periods of 6 to 12 days. Their orbits are also very close to each other. The distance between the orbits of 1e and 1f is .009 AUs – about 830,000 miles – and 1f passes within 750,000 miles of 1g. This is a system that, even according to its discoverers, shouldn’t exist – their model gives it only an 8.1 percent chance of surviving for a billion years – but as they point out, it obviously does. There are many more fascinating details about the Trappist-1 system and still more that we have yet to learn. The discoverers hope that further research, and the launch of the James Webb space telescope next year, will enable them to confirm the details of the planets’ atmospheres and possibly look for biological signatures. But in the meantime, for those of us who write SF, the discovery of the Trappist-1 system means this: we just got our pulp-era plots back. We’ve all read stories from the heady days of the 1930s in which the intrepid heroes travel to Mars or Venus in a few days, take off their space suits, breathe the air, encounter exotic life forms and interact with non-human societies. As we learned more about our solar system, that all got taken away. The jungles of Venus and the canals of Barsoom have long since been relegated to the realm of nostalgia, and if we want aliens in our stories, we have to cross impossible interstellar distances to find them. But now, there’s a system where all that can happen! Three habitable worlds with orbits less than a million miles apart, Hohmann transfers that can be done in a few weeks with inspired 1950s tech – we’ve got the ingredients for interplanetary travel that’s almost as easy as pulp writers imagined it. And a citizen of Trappist-1f might actually find that Old Venus jungle world one planet in and an arid Old Mars one planet out, and generations of its people could watch their neighbors’ fields and cities grow and dream of one day visiting them. All we need to do to make pulp stories into hard SF again is move them 40 light years. All right, we’d need to do a little more than that. The planets are tidally locked – and with zero eccentricity, they don’t have libration-generated twilight zones – so we’d need to model the day-side and night-side weather. We’d need to account for the tidal and geological effects of so many worlds so close together, and the atmosphere had better have plenty of ozone to protect against UV and X-ray emissions. But none of those constraints are deal-breakers, and within them, Weinbaum-punk is suddenly acceptable. That may not last, of course. By this time next year, the research team might have found that the Trappist-1 planets have reducing atmospheres or that there’s insufficient protection from stellar radiation or that some other factor makes pulp SF as impossible in that system as in our own. But right now, it’s wide open to stories of the imagination. We’ve found one spot in the universe where it’s the Golden Age all over again. you just made me realize that Firefly was not just a Western in Space, but also a retro-30s scifi tale for the same reason! They’re not necessarily tidally locked. They might be in some other resonance with the orbit, such that their day would be an integer fraction of 2 of their years. That kind of resonance usually happens in bodies with more eccentric orbits: for instance, the eccentricity of Mercury’s orbit is about 0.2. The Trappist-1 planets are believed to have near-zero eccentricity – that would pretty much have to be the case with their orbits so close together.